Published Oct 29, 2013 by Peachpit Press. Part of the Learn by Video series. This focused workshop provides three hours of high-quality video training on shooting green screen and covers everything from setup to producing the shoot to compositing the footage. 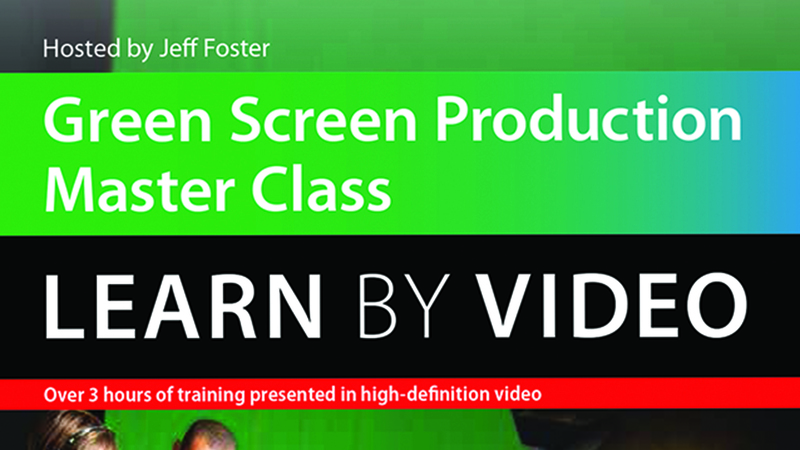 Author, trainer, and production/compositing expert Jeff Foster starts by introducing you to various concepts and explains how to create the right green screen scenario for your needs. Then, you’ll learn how to set up your background and talent, work with lighting and scopes, explore virtual sets, use helpful iPad apps, and composite the footage. The video is wrapped in a unique interface that allows you to jump to any topic and also bookmark individual sections for later review. The unique “Watch and Work” mode shrinks the video into a small window to allow you to work alongside in [name of software or say “…alongside as you view the video.”] as you view the video. Project files used in the lessons are included so you can practice what you’ve learned. At the end of every lesson, you can test your knowledge by taking interactive quizzes.